Based in Columbus, Ohio the flute and saxophone Tower Duo specializes in performing contemporary works by emerging composers. 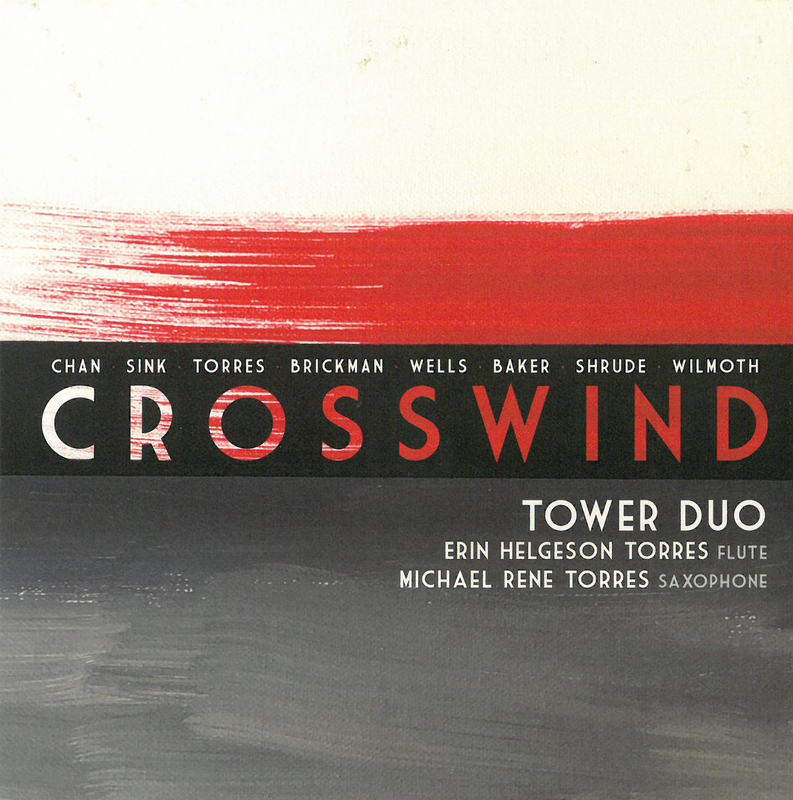 Flutist Erin Helgeson Torres performs regularly in various Ohio orchestras, while saxophonist and composer Michael Rene Torres serves as the artistic director of the Columbus Ohio Discovery Ensemble (dedicated to the promotion and performance of contemporary concert music in Central Ohio). Both are active teaching their respective instruments at area universities. 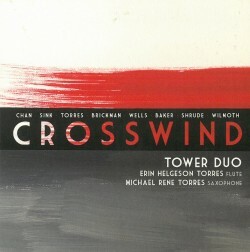 Performing new repertoire for their unusual wind instrument pairing (since 2007), Crosswind is Tower Duo’s debut album. 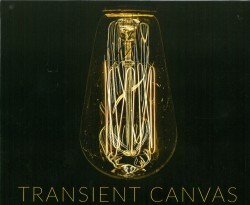 It features eight of the duo’s favourite compositions by as many American and international composers. 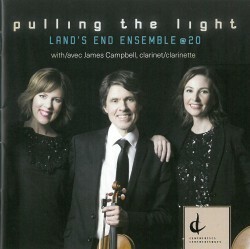 The album displays the duo’s mission: commissioning and performing new scores. Included is Scott Brickman’s epigrammatic Epic Suite (2012), Charlie Wilmoth’s disruptive Three Pieces (2013), Philip Sink’s Places Never Painted (2012), inspired by the composer’s poem evoking the quiet beauty of the natural world, as well as Michael Rene Torres’ four-part character study Four Short Episodes (2011). The title track from 2013 by Hong Kong composer Chin Ting Chan (b.1986), written for the duo, is an album highlight. 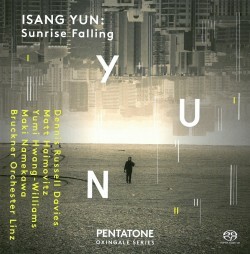 Full of extended techniques and reflecting Chan’s harmonically exact, rhythmically defined and structurally strict M.O., it pays close attention to instrumental timbre and colour, and two-voice polyphony. It’s also infused with a playfully dramatic, tonally exploratory mood. This lightness of mood and unstrained virtuosity happily permeate this album, enjoyable to listeners far from the borders of the Buckeye State. Prolific Canadian postclassical composer Jordan Nobles has won numerous awards for his scores, including a 2017 JUNO. He also serves as the artistic director of Redshift Music Society, among Vancouver’s most active contemporary music groups. In 2007 it launched Redshift Records, its own label, with an ambitious regionally rooted catalogue that today lists some 39 CDs. Nobles’ minimalistic collection of nine works collectively titled Rosetta Stone: Music for Multiples is among Redshift Records’ latest releases, selected from the composer’s Open Score Collection of 25 experimental compositions for non-fixed instrumentation. In the liner notes flutist Mark Takeshi McGregor notes that the idea of multiples – musical works composed for several identical or like-sounding instruments – has been a decades-long preoccupation of Nobles. “Whether it’s eight saxophones, six harps, or 24 vibraphones, the monochromatic ensemble presents a creative restriction” capable of surprisingly complex and attractive musical results. 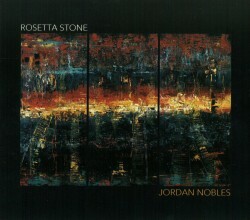 Using multitrack studio recording techniques Nobles opted to have each work on the album performed by a single musician, such as möbius (for ten grand pianos), or air (for 16 bass flutes). The musical results are remarkably varied, ranging from the dramatically breathy, dense, natural harmonics-based stereophonic swirl of air to the plucked string overtone-rich sound clouds of ephemera (for four seven-string electric guitars). Perhaps, like me, you’ll find the ever-modulating, plush but never saccharine bass-centric chords of still life (for eight five-octave marimbas) the peaceful six-minute soundbath you crave on a hectic day. Wanna know two sounds I love? Marimba and bass clarinet. Wanna know how I know? This disc is how. 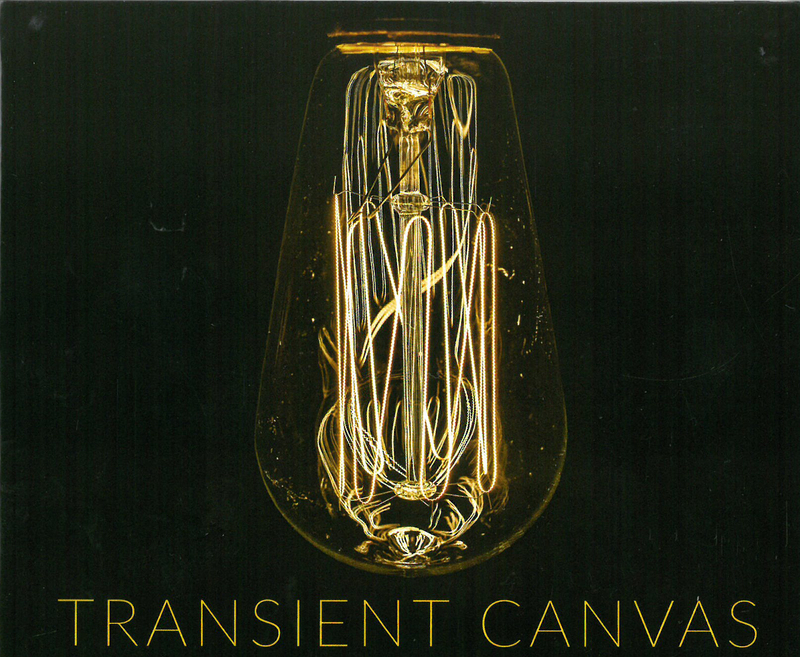 Transient Canvas is the duo in question, and their recent release is Wired. Each track features the duo plus electronics, mercifully the latter enhancing rather than distracting from the acoustic sounds. I’m writing in a manner as close as I can manage to their joyful goofy playing (clean and excellent goofiness, disciplined joy). This is like listening to two of your favourite flavours, say dark chocolate and roasted almonds, that go really well together. Or listening to two of your most beloved colours, say turquoise and deep brown, that set one another off, yet seamlessly blend. Much of the material is pop-sounding enough that the madness of the harmonies and jagged rhythms don’t jar the ear, they toy with it. It isn’t because it’s all from one composer who gets them or caters to their strengths: each track is from a different composer. Maybe the two (Amy Advocat on bass clarinet, Matt Sharrock on marimba) are really good at commissioning only composers who get them, or maybe the composers themselves just can’t find a way to put them off their game. After three bouncy tracks, there’s a complete change of pace in Hyggelig (Danish for chillaxin’), by Lainie Fefferman. The longest cut, at almost 11 minutes, is the aptly solemn solm by Mischa Salkind-Pearl. The final track, Epidermis by Dan VanHassel, is the most hard-core progressive, yet kinda bebop. Peter Van Zandt Lane’s Exergy Bubblebath wins the Most Whimsical Title award. 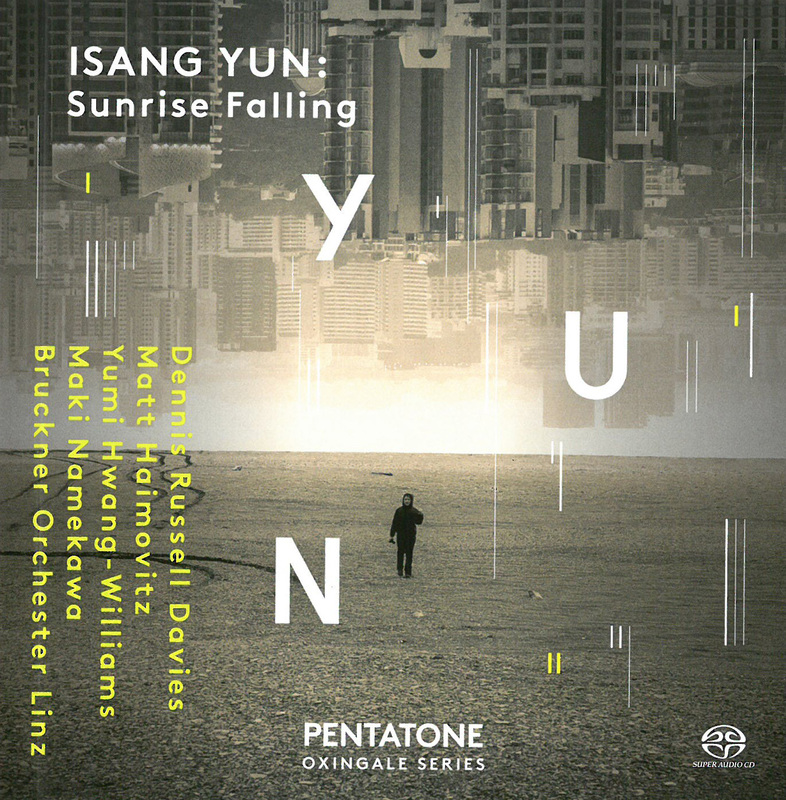 Isang Yun: Sunrise Falling is a centennial commemoration of the uncompromising life and music of Korean-German composer Isang Yun (1917–1995). Maestro Dennis Russell Davies, long a Yun collaborator and advocate, curated the program, ably conducting the Bruckner Orchestra Linz. Born in present-day South Korea and later re-establishing himself in West Germany, Yun certainly has one of the most unusual biographies of any composer of Western concert music. His is an epic story of a lifelong fight for Korean national independence and unity, thwarted by exile, all framed by the creation of some of the most emotionally gripping and transculturally cogent music of the 20th century. After establishing an award-winning composing and teaching career in Korea after WWII, in 1956 Yun relocated to Europe to further study composition, settling in Germany. His idiosyncratic style fully emerged in Gasa (1963) for violin and piano, evocatively performed on this album by violinist Yumi Hwang-Williams and pianist Dennis Russell Davies. Its score overlays Schoenberg-derived 12-tone gestures with complex sustained tones imbued with high emotion, the latter, an essential quality of traditional Korean music. On June 17, 1967 Yun’s life took an extraordinarily dramatic and life-threatening turn. He was kidnapped by the South Korean secret service from his West Berlin home. Taken to Seoul to face trumped-up charges, he was accused of being a North Korean spy even though he had only visited there as a tourist. Tortured in prison, he attempted suicide. He was forced to confess to espionage resulting in a death sentence, subsequently commuted to a lengthy prison term. Yun was eventually released in 1969, in great measure as a result of international outrage at his mistreatment and the injustice of the charge. He returned to a divided Germany never again to go back to his Korean birthplace. Yun’s dramatic biography informs his mature music – a convincing blend of Korean and European musical instruments, idioms and sensibilities – accurately reflecting the human and political drama and intercultural fabric of his life story. The album’s key works are the full-length Concerto for Violoncello and Orchestra (1976), and Concerto for Violin and Orchestra No.1 (1981), both imbued with autobiographical allusion. Virtuoso cellist Matt Haimovitz assays Yun’s intense score jam-packed with despair, as well as exultation over personal tragedy, with deep musicality and passion. Innovative timbral textures, such as the use of a plectrum on the cello to emulate the kŏmun’go (Korean zither), delight the ear. That technique also adroitly bridges the composer’s mid-20th-century Korean and Central European classical music worlds. The Neave Trio, comprised of violinist Anna Williams, cellist Mikhail Veselov and pianist Eri Nakamura, perform arrangements of Astor Piazzolla compositions in this new release without, in a refreshing change of musical pace, the composer’s ever present bandoneon. The resulting soundscape brings a new life to Piazzolla’s music. José Bragato is a cellist/composer who played in several of Piazzolla’s ensembles and here arranged the four-movement Las cuatro estaciones porteňas for the trio. Each movement is true to the Piazzolla sound, with the musicians playing abrupt tempo changes, rhythms, high pitches and mournful sounds with passion. Great extended solos showcase their commitment to the composer’s work in the final Invierno Porteňa movement. 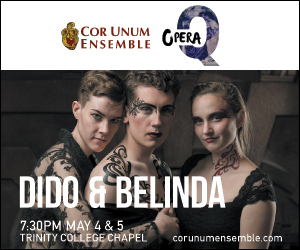 The trio is then joined by mezzo-soprano Carla Jablonski in five Piazzolla songs arranged by Leonardo Suárez Paz, son of Piazzolla’s band member violinist Fernando. Jablonski’s voice captures all the emotive sentiments especially in the familiar Oblivion, where the vocals are surprisingly able to emulate the bandoneon sound, especially in the lengthy held notes, while the trio continues to create a larger band sound. Lyrics and translations would be appreciated. The recording ends with a performance of Suárez Paz’s work Milonga de los Monsters. Though more atonal, touches of Piazzolla sounds surface in this technically amazing fun-filled performance. 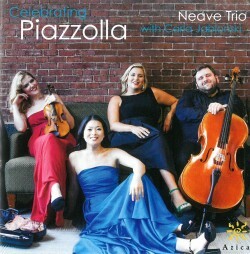 The Neave Trio is to be congratulated for their passionate fresh ideas of ensemble and instrumental performance. Their expertise in sound creation, playing and improvising create a new way to hear Piazzolla’s work.